It’s Thursday. We are only 2 days from the March for Babies. 2 Days! I’m excited, nervous, and hoping for good weather. Heck, I’ll take anything but rain at this point. This week, I’ve been focusing a lot on what happened 4 years ago. I’ve had old pictures printed, we had a news interview, and I’m writing our speech for Saturday’s event. It all brings back a flood of memories and emotions. With all those things happening, I woke up this morning feeling a little anxious and stressed. I thought it would be perfect to focus on what I’m thankful for this Thursday morning. Babies that can breathe, talk, and scream on their own. Even if that means waking me up at 6 am. Babies that can eat and drink on their own. Even if it means sitting in spilled milk, and stepping on something sticky. I don’t want to know what’s stuck to my sock this morning. Babies that can go out in public to story hour. 3 years ago, this wasn’t possible due to their underdeveloped immune systems. Over 50 lbs of babies. The twins birth weight was less than 4 lbs total. A visit from one of our Primary Care Nurses from the NICU. She came over to see the boys and make a donation to our March for Babies team. I love that we still keep in touch. Friends and Family that support our passion for the March of Dimes. They deal with my constant Facebook posts, emails, and texts pleading for their money, and I never get a complaint. Or anyone unfriending me…at least I don’t think. Friends and Family that will be listening to us tell our story for the millionth time, cheering for us, and walking with us. The ability to reach other parents with my blog. 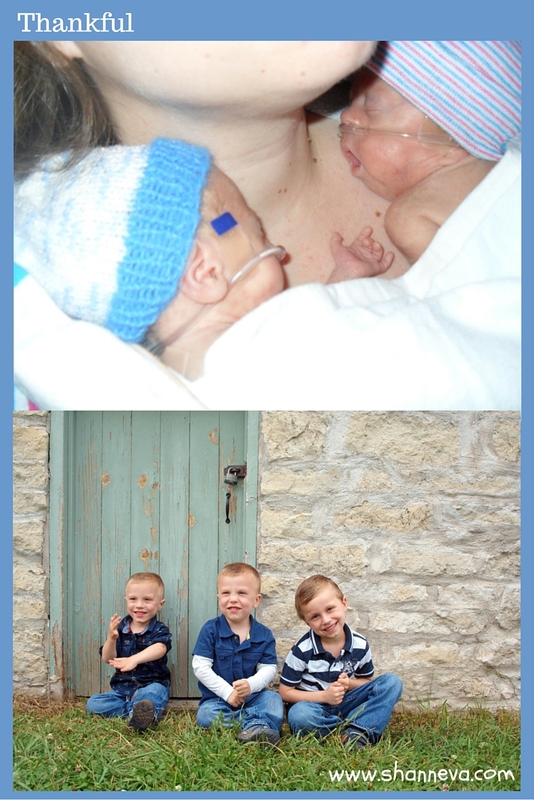 Finding others that had experienced a similar complicated pregnancy and premature birth was everything to me. I hope I’m paying that forward. The ability to share other premature birth stories, and educate people on how important research and development is in this area. I am always thankful to you for reading my blog. Whether it’s your first time here, or you read everyday, it means so much to me. From the bottom of my heart, thank you. That’s so wonderful that your friends and family have been so supportive and I’m glad to hear the babies are growing and healthy. Love, love, LOVE this!! How awesome and perfectly put! I owned a salon and a couple years ago I was taking donations at the salon for March of Dimes, we had received a good amount to give! Such an amazing thing to donate to! Your boys are so stinkin adorable!! Lots of good stuff to be thankful for – and good luck with the March of Babies! Can’t wait to hear all about it! 50 lbs of babies! Wow! That is a lot to be thankful for! And I’m sure your kids are thankful for you as well! I really hope that the weather is good for March For Babies! There are definitely so many wonderful things to be grateful for. You do such an amazing job on your blog by sharing you personal stories and other’s stories. Every post I have read has truly been amazing and so heart warming. One day! That came so quick! You have such a powerful experience to share and I’m sure events like this really bring that to the surface. Have a great walk!